Mirador 3-Bedroom Apartment is 5 minutes’ walk from El Born district and the well-known Santa María del Mar Church in central Barcelona. It has attractive views of the harbour and the sea. Free Wi-Fi access is available at the Mirador 3-Bedroom Apartment. The area is well-serviced by public transport, having Barceloneta Metro Station at 290 metres away, and Barcelona-Estació de França Railway Station at 3 minutes on foot. The elegant, air-conditioned apartment has a balcony and a living room with flat-screen TV, music system and DVD player. There is a full kitchen with a dishwasher and a microwave, as well as 2 bathrooms, one with bathtub. 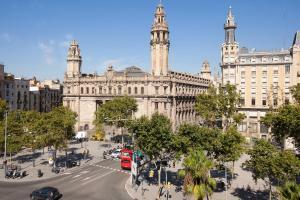 Barcelona’s main sights are within walking distance of the property. 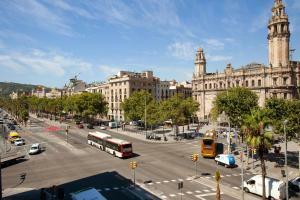 Plaza Catalunya and Las Rambas are 20 minutes’ walk away. El Prat Airport is 18 km away. After booking, you will receive an email from the property with payment and key pick-up instructions. Please notify to the Mirador 3-Bedroom Apartment prior to your arrival. Please note that there is extra charge for late check-in starting from 19:00 as follows: From 19:00 to 22:00 € 30; After 22:00 € 50. All guests receive a 10% discount at the property's Posta Ristorante & Pizzeria. Rate: € 150.00 ... € 400.00; select dates below to get current rates.